Quintet for clarinet, two violins, viola and cello A-dur KV 581 ("Stadler Quintet") was written in 1789 in Vienna and first performed on December 22 of the same year in a charity concert. The quintet clearly bears the features of the genre of concerto. Even in the beginning of Allegro A linear-like part of the solo instrument is juxtaposed with harmonious chords of the strings and it clearly represents a concerto style. The second movement is written as a slow Larghetto with chords of strings emphasizing a flowing melodious theme of the soloist. Menuetto represents a gallant minuet with two trios. Allegretto con variazoni is a theme with variations. A rhythmical and dynamic main theme is first supplemented with a free melody of the clarinet. In the course of the development and when it comes to the third variation the theme gets so "disguised" by an entirely different rhythmical pattern and "sobbing" grace notes that one can hardly recognize it. And finally the theme sounds in its original appearance once again. The Sonata for bassoon and cello B-dur KV 292 (KV 196c) was written in 1775 in Munich for Baron Thaddeus von Durnitz who was an amateur bassoonist and pianist. The Sonata consists of three movements. The first one, Allegro, is written in a pure sonata form without elaborating it. It begins with a lively and a bit bravura theme. Then the composer introduces a more melodious side theme. A transition from a diminished triad to a major one introduces somewhat plaintive intonation. The second movement, a slow and sedate Andante, combines the expressiveness of the wind instrument that resembles a human voice so much and a rich bass line of cello. The composer brilliantly attains here a perfectly harmonious and dignified balance of the two instruments. The Finale comes as Rondo with three episodes. Mozart discovers here the whole range of virtuoso resources of bassoon even before some more technical innovations were introduced into the instrument. Quintet for piano, oboe, clarinet, horn and bassoon Es-dur KV 452 was written in 1784 in Vienna and first performed on April, 1 of the same year in one of the Academies of music. The Quintet made a great success and Mozart once said: It's the best I've written in my life. The Quintet was so popular that was edited several times. In Vienna it was published as Quartet for piano and strings without consent of the author. 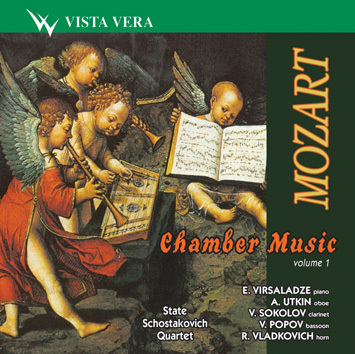 The Gombart & C publishers presented the work as Concertanta pour violin principale, hautbois, clarinette, corno, bassoon, violoncelle, alte et basse par W. A. Mozart. The Quintet also inspired Beethoven to write an ensemble of his own, Quintet No 16. There are three movements in the Quintet. The first one is a sonata Allegro moderato with an extensive slow introductory part of Largo. The main part takes a moderate fast tempo but is full of fine techniques and filigree grace notes. The themes of both main and side parts are of similar mood and are developed on playing up the sequent tunes of the main part. The second movement, Larghetto, is also notable for its rich ornamentation. The Finale represents a somewhat light rondo. There is no the affectation and refinement of the first movement but the melodious development goes faster and in an arch mood.